Flushing is filled with awesomely delicious and totally under rated joints. Locally savored chinese food and snacks brought overseas from a variety of regions of the mainland, plus an array of cheap eats from vietnamese, korean, to thai and malaysian, you name it, it’s got it, but over the years, only a handful of places have such great and consistent food that I revisit again and again, Main Street Imperial Taiwanese Gourmet is in that category. There’s at least 4 other taiwanese restaurants around the tiny perimeter of Main Street Flushing, this one is my favorite by far. 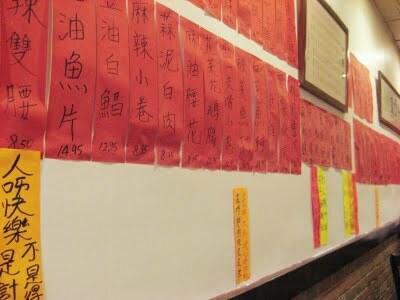 The walls are filled with specialty dishes and words of wisdom, basically how to live happily. 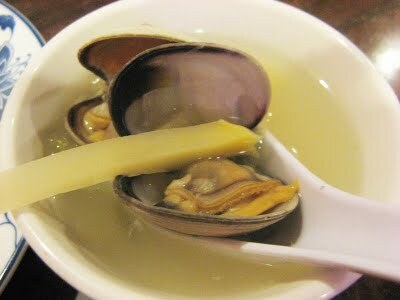 I like to start off with the Clam Soup with ginger and preserved(salted) mustard vegetables, it’s very simple and light, but you get the natural sweetness of the clams and a kick of sourness from the veggies, plus an intense ginger taste, great for these chilly days coming up. This is one of their specialties, therefore its under their “Most Popular Specialty Dishes” page of the menu #26, called the Hakkanese little stir fry in chinese. 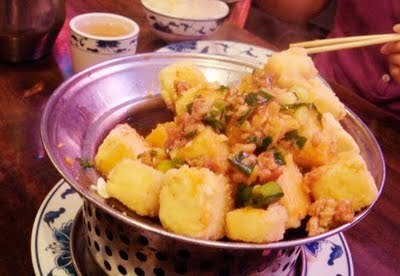 This is a popular dish in Taiwanese restaurants, but the one they make is different and so much better. It’s a mix of pork, squid, intestine (if you haven’t tried them don’t make faces yet), celery, tiny thai chili peppers and ginger, these ingredients are thoughtfully put together, there’s different textures and a real kick of heat, but I think what makes is their wok and the intensity of their open fire, you can clearly taste it underneath the condiments. The best way to describe it would be to think bbq and the flavors of the wood and charcoal versus electric. I order this every time, and I’m the type of person who loves to try new things. The next not to be missed dish is Chef Ling’s original creation, which has a unappetizing name but taste unbelievably fragrant (in a oniony garlicky way), and goes oh so well with pipping hot rice, literally in Chinese it’s called Flies Head, don’t worry, there weren’t any insects harmed in making the dish, it’s only making a visual reference to the fermented black beans, which are salty and melt in your mouth by the way. This is also in their “Most Popular Specialty Dishes” page of the menu, #27, and features fermented black beans, ground pork, chinese chive flowers (similar to chives, but it’s thicker, more flavorful and has an edible bud on top), garlic, and these atomic little chilies. Everything is chopped really fine, so the green little chilies are camouflaged as chive flowers, therefore I have to be extra careful, and pick them out individually, try one and you’ll know why. The Tofu Casserole is also excellent, comes in a burn your tongue hotness level, and super garlicky. 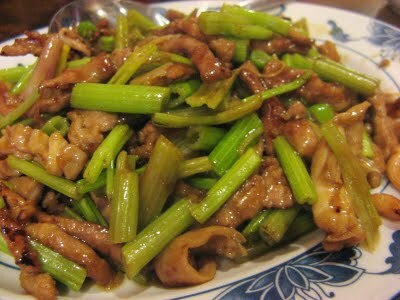 Deep fried layer with a light coating on the outside, and soft melt in your mouth center, topped with scallions, garlic, ginger and minced pork, soooo good! Another great dish is their Bitter melon with a Taiwanese berry called “Pu-tz”, that is if you’re into bitter melon like I am. Or try bitter melon with salty egg and ginger. There’s plenty of less “adventurous” dishes, like fried pork chops/chicken on rice, sweet and sour pork and such. Other things you might wanna try are the Owa Jen or Oyster Omelete (taiwanese style, comes with a slimy in a good way batter with eggs, spinach and sweet chilli sauce, it’s an acquired taste for sure, but worth a try. The 3 Cup Chickencassorole is also quite tasty, cooked in a soy base with chinese basil, basically you can’t really go wrong here, the chicken comes with a deep dark color, super moist. I love stinky tofu, but this isn’t the best place for that. This place is a little further away from the 7 Train stop and closer to the LIE, if you take the 7 you would have to transfer to Q44 for about 10 minutes, trust me, it’s worth your trip. So far, from all of my visits, I’ve only seen chinese people eat here, mostly Taiwanese, so you know it must remind them of home. 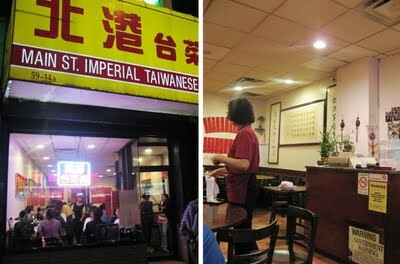 If you’re up for an authentic Taiwanese food adventure (none of that NY Cravings over priced baloney), hop on the “international” 7 train and give this place a try, don’t be scared, you got the menu #s and my pictures as reference, and even if you make a mistake ordering, most likely it will taste pretty good. OOOOh my gosh, thanks so much for giving the number references. Basically, I used to go here ALL the time with my Taiwanese ex-boyfriend. He ordered all the food and I just scarfed everything down, very happily so, including these three dishes you listed. Unfortunately, things got really sour between me and him and I haven't gone back to that place because I don't speak Taiwanese and had no idea where they were on the menu. And… asking him is out of the question! Now I'm totally ready for a trip back there. THANK YOU!!!! You're very welcome! I'm glad you can have these dishes again… they are too good! happy eating! Please post more pics with their descriptions!!! I love their food and I don't know how to read Taiwanese! This little place is incredible!!! Me too a big fan of this little cozy Taiwanese restaurant. There have not been any disappointment since I started eating here a few years ago. I especially like their 3-cup chicken, stir-fried kidney, and flies head. I like flies head so much I even put together a recipe shared it on my blog. Strongly recommending!